Canada and the United States signed the Automotive Products Trade Agreement (Auto Pact) in 1965, thus resolving a competitive crisis in Canada's auto industry and extending that industry's vitality for another 35 years, until a decision of the World Trade Organization (WTO) in February 2000 determined that the Pact violated international trading rules. Following an unsuccessful appeal by Canada to the WTO's Appellate Body, the pact formally came to an end in February 2001. For policymakers and scholars concerned with international trade, the story of the Pact presents a fascinating case in its own right. The great value of this remarkable book, however, is its elucidation of the main issue underlying the Pact and its forced ending: the relationship between international trade rules on the one hand and investment measures intended to encourage local economic activity on the other. In this connection the Canadian auto industry – centered in Windsor, Ontario, directly across the river from Detroit, the heart of the industry in the U.S.– offers an intensely concentrated sample of the triple nexus of investment, labour and trade that lies at the core of economic development worldwide. • the persistent failure of the WTO to reach a consensus on labour standards despite the clear provisions of major international law instruments. All these issues and more are brought into sharp focus by the history of the Auto Pact and the implications of its demise. For this reason, this collection of insightful essays will be of incomparable value to professionals in every area of international trade. 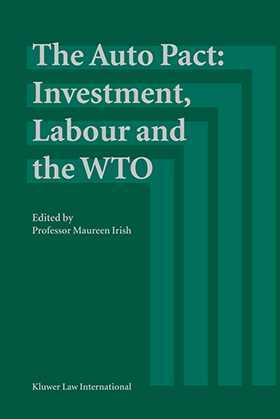 The Auto Pact: Investment, Labour and the WTO was produced with the support of the Canadian-American Research Centre for Law and Policy at the Faculty of Law, University of Windsor. Contributing Authors. Editor¿s Introduction. Part A: Background. The Auto Pact from 1965 to the Canada-United States Free Trade Agreement (CUSFTA); J. Holmes. The Auto Pact, NAFTA and the Mexican Automotive Industry; M. Appel Molot. The Automotive Industry in Windsor; H. Colling. ¿We Can Tell Them All to Go to Hell¿: The CAW, Multinationals and the Auto Pact; V. Cross. Part B: The WTO Decision, Investment and Subsidies. The WTO Decision¿MFN, National Treatment, TRIMs and Export Subsidies; J.R. Johnson. Rules of Origin for Goods and Services¿WTO Origin Agreement and GATS; N. Komuro. NAFTA, Article 303, PROSEC and the New Maquiladora Regime in Mexico; D.A. Gantz. Investment Subsidies and the Canadian Agreement on Internal Trade; B.P. Schwartz, K. Boryskavich. The Evolution of Foreign Direct Investment Law: From an Inter-State to a Transnational Dynamic; L.C. Reif. Part C: Investment and Labour. Linking Labour Rights and International Trade: Evaluating the NAALC Model; N. Keresztesi. The ILO Declaration on Fundamental Principles and Rights at Work: The Limitations to Global Labour Standards; A. Reed, C. Yates. The Organization for Economic Cooperation and Development Guidelines and Corporate Codes of Conduct; J. Salzman. Labour Rights and International Trade: A Debate Devolved; K.R. Gray. Property Rights and Labour Rights Revisited: International Investment Agreements and the ¿Social Clause¿ Debate; C. McCrudden.